"Bring me the anatomy book" has to be the greatest line from a movie in 2017. 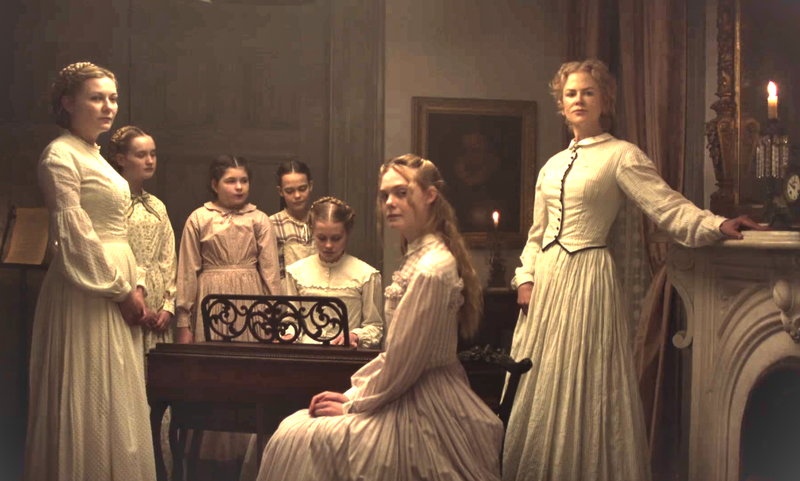 It comes from Sofia Coppola's The Beguiled (and I have no idea if it's originally from the novel, or the first film adaptation of this material, from 1971), and uttered with cold precision by Nicole Kidman's character, who's about to execute her very first amputation. The film is set at a girls' school in Virginia, during the seemingly endless slog of the Civil War. Several of the girls have remained at the school, under the care of its very proper headmistress (Kidman) and the one remaining teacher (Kirsten Dunst). This is essentially a finishing school, where girls learned how to be young ladies. While they do make time for academics, the real teaching that goes on is about the domestic sphere, a woman's primary place of influence and identity during this period. The film explores the ways in which the unexpected arrival of a man (a wounded Union soldier played by Colin Farrell) upsets the very carefully constructed world of these women and girls, and how their own desires come into direct conflict with the lessons they're trying to teach (or learn). The Beguiled is fueled by a subtle, unflinching irony, which may be the reason I felt a degree of cold admiration for the film, rather than genuine pleasure. It's impeccably made (Sofia Coppola continues to prove herself a truly talented and original filmmaker) and acted. The ways that Kidman and Dunst exert control over each other, and over Farrell's character (a man whose moral compass we're never quite sure about), is its own kind of mesmerizing puzzle, and these actors bring out the intricacies of sexual desire and sexual politics in the very repressed 19th century. (Farrell flirts with both of the women, and several of the students; his affection creates a tension between all of them, who have suddenly realized a desire they didn't know they had.) But The Beguiled didn't affect me on a visceral level, which may have been what I was expecting from it, and so the movie left me somewhat unmoved, despite all of its many fine elements.